AWith our Africa Airways series flying high we felt it is time to introduce a new compilation focusing on the unique contribution from some of Africa's most recognised female artists and some lesser known ones for good measure. We are excited to be launching this on Women's Day 2018 as our way to highlight the incredible, yet under-acknowledged musical contribution that African women have given to the funky sounds of Africa. 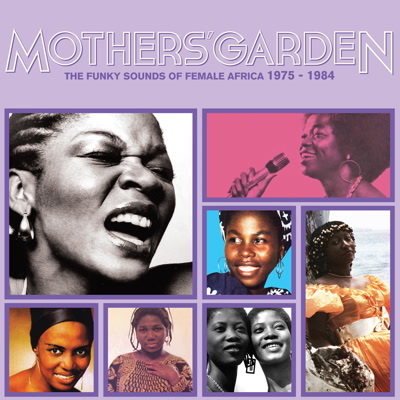 Taking our cue from the Alice Walker essay "In Search of Our Mothers' Gardens", the creative sparks that inspired this collection of songs were formed in their Mothers' Gardens by Mothers who paved the way for their daughters to keep the creativity of black women alive through their strength and resilience. Whilst we have a bit more of a message with this one, we wouldn't be Africa Seven if it wasn't damn funky at the same time! We kick things off with the infectious sound of South-African Letta Mbulu. Letta started her career playing alongside fellow heavyweights Miriam Makeba and Hugh Masekela as cast members of King Kong in the 1950's and has since gone on to become one of the most influential south-African artists, even featuring on Michael Jackson songs, as well as being recognised for her contribution both musically and to that of the country's liberation struggles. With a crate-digger, secret weapon version of her classic Kilimanjiro single, "Kilimanjiro, Take Us Higher" is longer and has all the disco groove and delight you need and desire from such a star. Uta Bella takes over from Letta, with a powerful Africa Seven return. "Enyin" is a glamorous disco scorcher heightened by glittering keys and irresistible West African vocals. One of Nigeria's unsung pioneers, and first female pop bandleader, Mona Finnih continues the flow with an effortless boogie number "Ani Kewa Jo" which just keeps on giving for nearly 7 glorious minutes. This devastating 80's number "Nou Ke Sa Inmew" from Cida Desvarieux follows up Uta and is dealt in two halves. Firstly a hit of beautiful vocals and slap bass controls the floor before handing over to the powerful guitar riffs and horns which groove out for the rest of this number. Wrapping up the first side with a classy reggae inspired number "Time Waits For No One" is Christy Essien, the grand dame of Nigerian pop, who was never far away from the issues affecting women in the Nigerian music industry. Side two, enter Togolese singer Akofa Akoussah causing a storm with "Tango", delicate at times yet with a ferocious, unforgiving energy. Next a more obscure offering from Carmen Ezumah with vintage afro goodness in the form of "Tala Tala". Moving on, we have the Nigerian Lijadu sisters (dubbed "the West African Pointer Sisters") with one of their most notable hits "Danger". Our penultimate offering is another dose of obscurity, sandwiched between two greats, with Kenyan Bakambi N'Kela's uncompromising "Kilimanjoro". Mothers' Garden finishes the way we started. With another one of Africa's leading ladies and music royalty, Miriam Makeba. Nicknamed Mother Africa, Miriam is famed for her huge musical contributions, her role in fighting the apartheid and for becoming a UN Ambassador. "Xica Da Silva" is a cover of Jorge Ben and the slow, hypnotic rhythm allows for the power of Miriam's voice to shine through.